Before we talk about Oculus’s motion-tracked Touch controllers, I want to take a moment to discuss how badly the company miscalculated. Back in April when the Oculus Rift virtual reality headset and its competitor, the Valve-backed HTC Vive, launched it was easy for me to give them equal scores and say it was a toss-up. Sure, I had an inkling that once you dabbled with the Vive’s room-scale VR it would be hard to go back to the mostly-stationary (whether seated or standing) experience proffered by Oculus. But it was just an inkling, based mostly on anecdotal evidence. Would room-scale actually catch on? Would people even have space for it? Those questions loomed large. And to some extent we’re still in that gray area. Perhaps room-scale is only feasible for enthusiasts, the people willing to convert an entire room around a technology. Maybe it can’t penetrate the mass market in the same way stationary VR could. Maybe. I underestimated one aspect, though. It doesn’t matter what consumers want if you can’t get developers to follow, and while room-scale is still a risky enterprise it’s clear where developer’s interests lie. There’s been an incredible dearth of software on the Oculus Rift. Despite the fact Oculus had years of advance planning and has proven willing to pay anyone and everyone for software exclusives, the Oculus Store has barely added anything since launch—I’d estimate it’s still shy of 100 titles as of December 4. Before you go “Well that’s just the Oculus Store, they’re picky,” let’s take a look at the overall Steam numbers for both the Rift and Vive since Steam's willing to take just about anything these days. The grand total of available VR experiences as of today? 942 Vive titles versus 343 Rift titles. Searching both categories together brings up a total of 980 VR titles, meaning most of those Rift titles are also available on the Vive. Yes, the Rift has some titles exclusive to the Oculus Store, but it’s still a huge gap. And yes, a lot of those Vive titles are low-effort shovelware, but I’m not here to gauge quality, I’m here to gauge enthusiasm. It’s clear developers are just more excited about the potential of room-scale VR. And so we come to the release of Oculus’s Touch controllers, which (at least on paper) bring the Rift up to parity with the Vive. It’s like a second launch for the Rift, with Oculus boasting that it’s adding 53 titles to the store on December 6—mostly Vive titles ported over. Still, it’s huge for Oculus. I’m not sure, but I think that’s more in one day than Oculus has added to the store in the last nine months. Remember that provision I tossed in above though? “At least on paper”? It’s time to talk about the Touch controllers themselves—both strengths and weaknesses. The actual Oculus Touch controllers are a huge strength. They’re beautiful. A few years back Oculus hired on the team that built the legendary Xbox 360 controller and yeah, it was worth it. Using Touch is the closest I’ve come to using my actual hands in VR—and yes, it’s better than any of the sensor-enabled gloves I’ve tried. 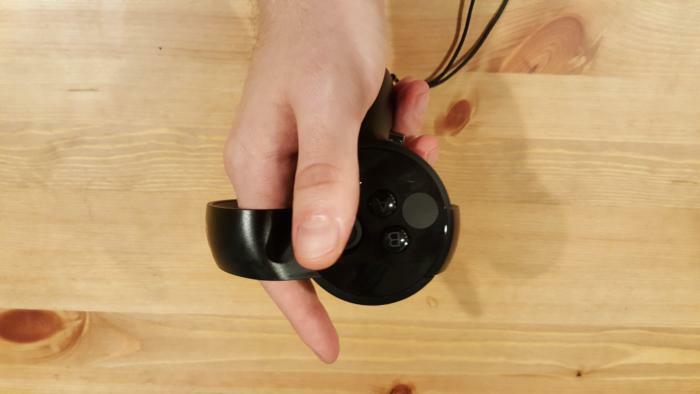 Button-wise, Oculus Touch is almost identical to the Vive’s wand-like controllers—you still have grip buttons, triggers, and a smattering of buttons on top. But Touch places these buttons better, with the controller mimicking the shape of your hand at rest. It also does some fascinating things with capacitive buttons and triggers. With the index finger, for instance, you can pull the trigger fully closed, rest your finger on the trigger but not pull it, or let go of the trigger completely. Each state is tied to a different finger animation, so if you let go you’ll see your index finger point out straight. This also applies to the Grip trigger (your three outermost fingers) and the thumb, allowing you to mimic a fairly wide range of hand gestures just by adjusting what parts of the controller you’re touching. They’re an incredible leap forward, and while I wouldn’t say the Vive controllers are bad they’re definitely less refined. 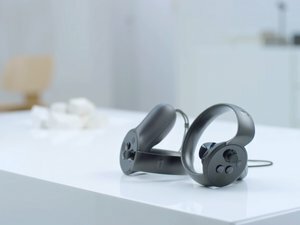 HTC’s system doesn’t include capacitive buttons, nor does the Vive in any way try to mimic the shape of an actual hand. Hell, I even have trouble sometimes figuring out which Vive controller is Right/Left if I set them down during a session. By comparison, each Touch controller is molded for right- or left-handedness, meaning you’ll never have that issue. 1) The controllers don’t sit on a table in any natural way. You have to plop them on their “Tops,” otherwise they’ll roll onto the facing edge. It looks bizarre, and I think most people will end up hanging them on a hook when idle. 2) AA batteries? What is this, 1995? I’ve gotten so used to everything charging with MicroUSB that the fact Touch takes a AA battery in each controller irks me more than it maybe should. Oculus Touch is excellent, though. Small concerns don’t detract from the overall quality of these controllers, and you can tell it’s had an impact on Valve. At the recent Steam Dev Days, Valve showed off new Vive controllers that look suspiciously like Touch. I expect we’ll see more about those at GDC 2017. The controllers are great, so where does everything go wrong? 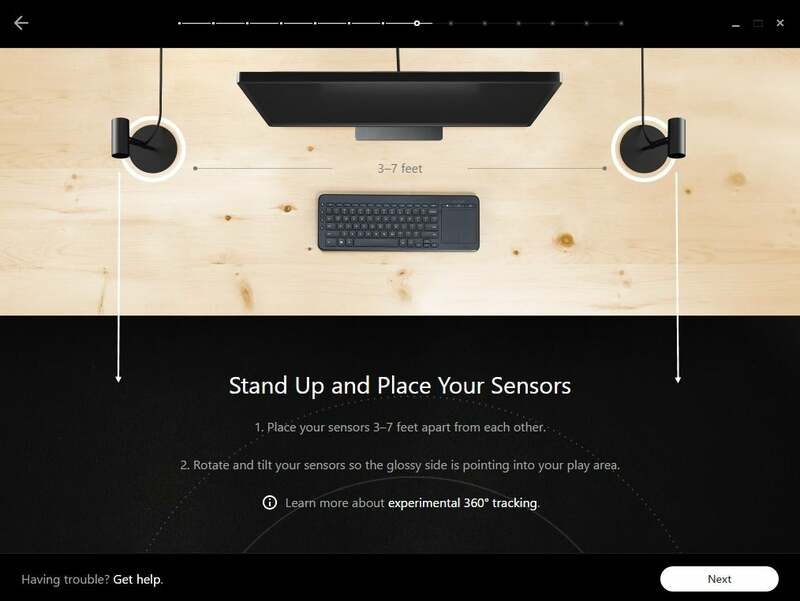 Oculus’s sensors. I’d say I’m surprised, but I’ve been talking about the poor range of Oculus’s cameras since way back at the Rift’s launch, and the problem is only exacerbated by a move into room-scale VR. With two sensors—the one that came with the Rift and the one included with Touch—Oculus eschews the diamond-shaped, cross-room pattern of the Vive and instead wants you to set up both sensors in front of you, approximately three to six feet apart. This immediately causes problems, because obscuring a Touch controller from the sensors is as easy as turning around. The sensors lose tracking, you lose a hand, and voila, you’re the world’s worst magician. There is an "experimental" 360-degree tracking setup, similar to the Vive, but it's not officially supported in the setup app yet (it's currently detailed in a PDF) nor does it support an area as large. 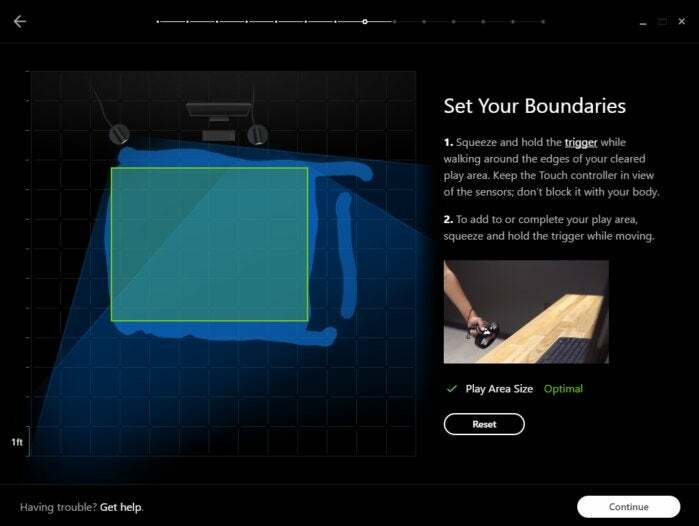 The maximum space suggested by Oculus for a dual-camera system is 1.5 meters on each side, which is smaller than even the smallest possible room-scale setting on the Vive (1.5 by 2 meters). But at least you won't have to deal with controller occlusion. Assuming you're using the officially-supported dual-cameras-in-the-front setup though, it gets worse. Oculus’s sensors have a very tight cone within which they’re useful, which wasn’t a huge deal for stationary VR, but it’s a massive headache for room-scale. Setting up your two sensors is a finicky process that involves the program trying to guess optimal angles for each camera, but even then you’re likely to encounter a ton of dead spots. For me, it’s anything within a foot of my desk and anything above 6.5 feet in the air. “Okay, well just move the sensors back further on your desk and angle them upwards,” you say. Sure, I can do that, but then I lose anything below knee level. Since receiving Oculus Touch I have tried every permutation I can think of: Cameras on opposite ends of my desk, one camera on my desk and the other strung across to my kitchen counter, desk raised to eye level (it’s a sit/stand desk) with the sensors angled slightly down, desk lowered to knee level with the sensors angled up, one sensor at the center of my space and the other angled in from the side, et cetera. The list goes on and on and on. I’ve changed the position of my two Rift cameras literally every single time I’ve used Touch, and no matter what I do I eventually find dead spots. I then rearranged my room to be more like Oculus’s press demo lounges—huge and empty, so you can start your play area three feet back from the cameras and let their cones overlap a bit better. And yeah, that helped, but you start encountering other issues: The range isn’t great, so you can’t move more than maybe eight feet away before it starts to have problems, and even if you could the damn Rift headset cable is too short. Multiple times this week the Rift cable has pulled taut against the back of my PC because I’d managed to reach its greatest extent. The Vive? Yeah, I’ve never had that problem. Its cable is something like six feet longer. The whole issue might be avoided if you mount the Rift’s cameras on the wall, like the Vive, but there’s no hardware included with which to do that—and you’re limited by the short USB cables, which the Vive’s Lighthouse sensors don’t need to deal with (because position is tracked by the headset). Oculus did at least build in a “Guardian” system, mimicking the Vive’s Chaperone. You input the edges of your play space, and when you get close it pops up a sky-blue grid as a warning. That’s something Oculus Touch has sorely needed in press demos for quite a while now. The extra blue lines on the right side are where I normally draw my Vive’s boundaries. The line breaks are where Oculus lost tracking—even though it said it’s within sensor range. But in so many ways it’s clear the Touch controllers are an add-on for the Rift, and that room-scale was not the vision Oculus started with. Aside from the actual Touch controllers themselves, everything about the Rift seems geared towards a stationary set-up, then retooled for the encroaching room-scale threat, with scattered results. Nowhere is that last fact clearer than in the fact Touch is sold separately. It’s my last big complaint, but maybe also the most important. Will Touch sell? Will people who blanched at the Vive’s $800 price tag be willing to pay a total of $800 (or more, if you buy a third camera) for Oculus’s own room-scale solution—one I don’t think works as well? If there’s any saving grace here, it’s the fact the Vive exists. Developers are making room-scale content regardless of how many people buy Touch, so there should be a steady stream of VR experiences available to Oculus. You’ll already see the effects of that at launch: Job Simulator, Fantastic Contraption, Space Pirate Trainer, and other popular Vive titles are finally landing on the Rift. Rift owners can finally work that 9 - 5 robot life. That’s in addition to whatever Oculus funds itself, of course. 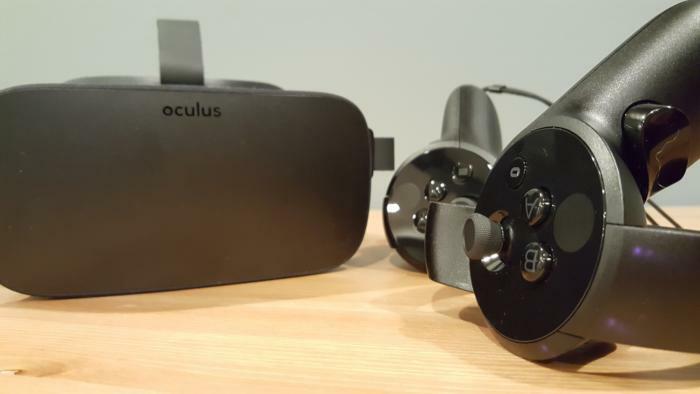 Medium and Quill are the two Touch standouts at launch, and both are in-house Oculus projects. And like the Vive’s Tilt Brush, both are creative apps—Medium lets you “sculpt” digital clay, while Quill is a powerful drawing tool. 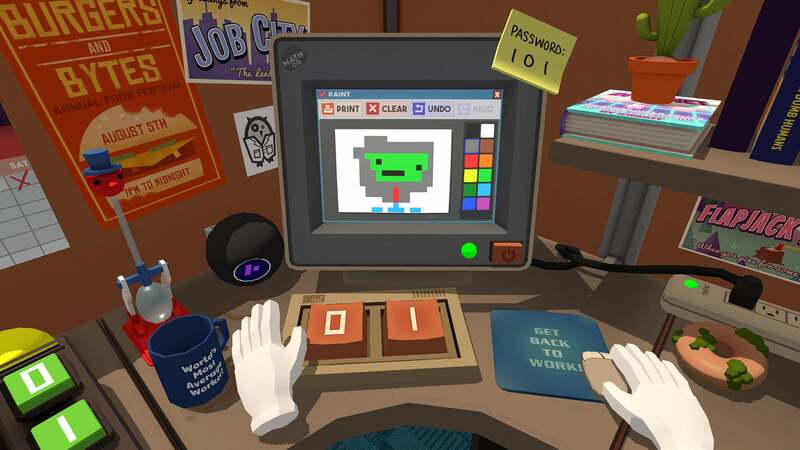 Games still get a lot of VR’s attention, but I think artists are the true benefactors here. 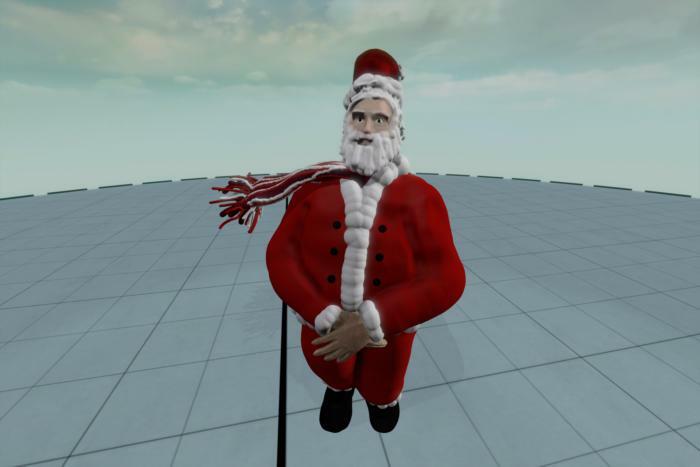 Sure, he’s a bit short, but I sculpted and painted this Santa in Medium all by myself—and in about an hour. I can’t do that in Blender. Competition is great. That’s the real takeaway here. If the Vive hadn’t come along, we might still be stuck with Oculus’s original sit-down VR vision for a while longer. As it stands, room-scale is the new normal, and Touch leapfrogs the Vive to some extent, with extremely comfortable and intuitive controllers that add a whole new layer to VR interactions. This is what the Rift should’ve shipped with in the first place. It’s just a shame that Oculus’s entire platform can’t quite make the pivot. If you’re seeking a true room-scale experience on the Rift you’ll probably need to ante up for a third camera (you can buy them separately for $79 each) and even then you’ll likely notice limitations that the Vive just doesn’t struggle with. 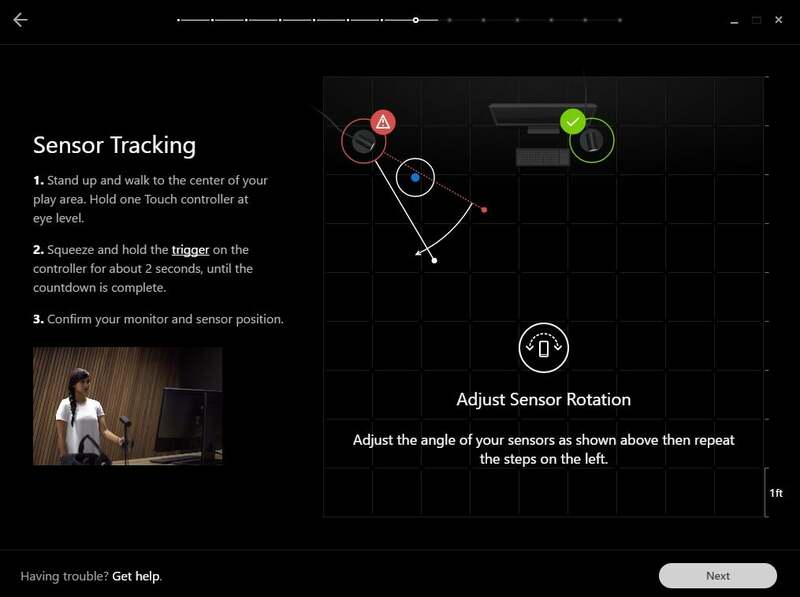 Oculus's motion-tracked Touch controllers are about as close as you can get to using your hands in virtual reality, but it's hard to take advantage of their full potential due to endemic platform problems.